Material: Soft, very comfortable fabric. Very snug. when worn as an outer layer performed quite well fending off a strong wind. Fit: Tester: female, 5'8", medium build. Extremely snug. Good deep adjustable cuffs. Adjustable drawstring hem worked well without getting in the way or dangling. Collar: High enough to shield my neck from the wind. Zips goes all the way to the top of the collar. Collar (and zip) are same colour as the rest of the fleece. Pockets: Reasonably deep pockets at front with zipped openings. Pockets are lined. Useful third internal zipped security pocket. Zips: Front zip and pocket zips tagged for easy opening. All zips ran smoothly. Front zip has a covering flap that works to prevent the wind going straight through the zip. 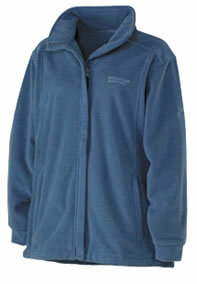 Other considerations: Good fleece. Could be worn as a mid-layer in winter - or outer layer on a spring/summer day. Slightly bulky if trying to pack down and carry in a rucksack.